A predisposition to use rockets derived from military ballistic missiles, forced by the military competition between the United States and the former USSR, curtailed efforts to develop alternatives to chemical rockets together with practical commercial developments. With the orbiting of Sputnik, the aircraft path to space, represented in the US by the series of X planes [Miller, 2001] and with the X-15 [Jenkins and Landis, 2003] came to an end. With the X-15 demise, all efforts to fly to space ended and was replaced by the more familiar (but less practical) strategy based on blasting to space with expendable rockets derived from not-so-well-tried ballistic missile hardware, as early failures documented. Like their ballistic missile progenitors, current expendable rockets are launched for the first, last and only time. In this context a reusable launcher is simply an expendable with some parts reused a few times. Thus neither the USA nor the former USSR have ever realized a truly commercial approach to space travel, although the former USSR was close to achieving a first step with the Energia/Buran system. Energia flew first on its first flight with a cargo pod installed. Energia/Buran flew only once after that. The several Energia launchers and the two Buran hypersonic gliders were eventually scrapped or sent to museums. The roof of the assembly building at Baikonur collapsed in the late 1990s and perhaps the most ambitious, fully recoverable launcher and glider system to have been built was no more. Both the United States and the former USSR have generated a large number of concepts that could fly directly to space and return on a sustained, frequent, and scheduled basis. The subject of this book is space propulsion; however, in exiting the Earth's atmosphere, the propulsion system and configuration are inexorably linked. An aircraft that is a hypersonic glider exits the atmosphere on either rocket boosters or a first stage of a two-stage-to-orbit aircraft. As such it exits the atmosphere quickly, and the key exit design considerations are the high aerodynamic and mechanical loads encountered in the exit trajectory. Whether a new launcher or the Space Shuttle, the phenomenon is the same, the peak mechanical loads occurring during exit in the region around Mach 1. In this case the exit aerodynamics are important but not vital. The vital aerodynamics and thermodynamics (aerothermodynamics) are in the entry glide, where thermal loads are a maximum and must be controlled. The vehicle must always be controlled in flight so that its attitude and direction are within limits set by aerothermodynamics. The angle of attack limits are very close for high-performance hypersonic gliders, as their glide angle of attack is 11° to 15°, not the 40° of the US Space Shuttle. Even the Russian Buran had a lower glide angle of attack than that of the Shuttle. The Russian Central Aerodynamics Institute (TsAGI) reports show that it is about 30° to 35° [Neyland, 1988]. Like Buran, the high-performance glider is best controlled by an automatic integrated flight control system that monitors the thermodynamic state of the vehicle as well as the aerodynamic and trajectory states. The sensor array provides real time information to the control system that can maintain the correct attitude in a manner a human controller would not be able to accomplish. So it is this phase of the flight that "designs" the vehicle. Since staging, that is, separation from its first stage launcher, occurs in the Mach 8 to 12 range, the propulsion system is usually a hydrogen/oxygen rocket. That means that the configuration is designed for entry, and that propulsion does not determine the configuration. An aircraft that uses airbreathing propulsion to exit the atmosphere has the same entry issues as the hypersonic glider. However, the capture of atmospheric air to create thrust by chemical combustion is an additional and different issue, as it must configure the underside (aerodynamic compression side) as an integrated propulsion system that produces more thrust than drag and that also produces lift. For the propulsion system to function efficiently the dynamic pressure and air mass flow per unit area must be higher than in a rocket exit trajectory, as it is the airflow that enables the propulsion system to produce thrust in excess of drag so the vehicle can accelerate. Thus in this case we have a propulsion-configured vehicle. Neither the shape of the vehicle nor the trajectory it flies are arbitrary. The air-breather does not exit the atmosphere quickly, as the rocket does, but stays in the atmosphere to the point where the transition to rocket propulsion occurs (usually Mach 8 to 12). The airbreathing propulsion system mechanical, aerodynamic, and thermal loads act longer and are of greater magnitude than the rocket-powered vehicle. In fact the dynamic pressure, that is the pressure of the air impacting the vehicle, is about ten times greater than the entry dynamic pressure of the hypersonic glider. In this case the principal thermal load is encountered during exit from the atmosphere, and the vehicle must be configured to generate sufficient thrust to exceed sufficiently drag to provide a strong acceleration. So an airbreather configuration is different from the hypersonic glider, because the hypersonic glider has not been configured to fly extensively in the atmosphere and produces thrust from a captured airflow. Like the hypersonic glider, this vehicle needs the same glide performance at entry. However, with the thermal protection designed by the high exit loads, the entry design is one of detail in maintaining stability and control, and achieving a comparable lift-to-drag ratio while gliding. There is one exception, that is, as we will see in later chapters, there is an airbreathing/rocket-powered hypersonic rocket that operates at a lower Mach number (compared to orbital Mach number of 25 plus) and can accommodate a retractable inlet working up to about Mach 5. The question is always, why bother with airbreathing at all if it is that much of a challenge. The answer is twofold. (1) Oxidizer carried is heavy, and requires more engine thrust to lift it into space. A hydrogen/oxygen rocket, vertical-launch vehicle with a 7,000 kg payload has a gross weight in the 450,000 to 500,000 kg range and has a 50,000 kg operational empty weight, that is, with the payload loaded. The engine thrust for a vertical takeoff is about 5,950 kilonewtons to 6,620 kilonewtons. A modest performance combined-cycle airbreather that transitions to rocket at about Mach 12 has the same empty weight with payload installed, but a gross weight in the 200,000 to 225,000 kg range. The engine thrust for a vertical takeoff is about 2,650 kilonewtons to 2,980 kilonewtons. Most of the gross weight reduction is from the lesser amount of oxidizer carried and the lighter propulsion system weight. So the installed thrust is about one-half, and the volume is less. An advanced airbreathing system has the potential to reduce the gross weight to the 125,000 to 150,000 kg level (the attributes of different propulsion systems and their impact on size and weight are discussed in Chapter 4). (2) An operational system is sought that is capable of a large number of flights per year. Less resources required for launch means that the system can operate at greater ease and has the potential to operate from more bases. 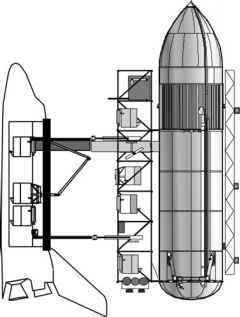 Glebe Lozino-Lozinski had a concept for a spacecraft with a seven metric ton payload carried atop an Antonov An-225, with a second aircraft carrying the liquid hydrogen, launch facilities and staff [Plokhikh, 1989]. It could literally launch a satellite from any facility that could accommodate a B-747 or Airbus 380.